Take mobile entertainment to the next level with the Huawei MediaPad T5. 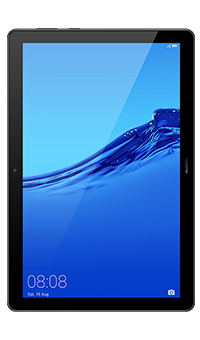 Boasting a Full HD screen, cinematic sound system and a robust performance while weighing only 460 grams, the T5 elevates your tablet experience big time. Carefully crafted from lightweight metal, the Huawei MediaPad T5 is as easy on the eyes as it?s convenient to carry around. Get a kick out of its refined symmetrical design, and slide this slim tablet in your bag when you?re done – at only 460 grams, you?ll hardly even notice it?s there. Never be bored on your commute again. The MediaPad T5 features a 10.1-inch Full HD screen with rich detail and true-to-life colours, making it perfect for catching up on the latest episode of your favourite TV show or scrolling through your social media. Enjoy breath-taking cinematic sound thanks to Huawei Histen audio technology. Whether you?re watching a blockbuster or blasting your favourite album, the MediaPad T5?s dual stereo speakers provide high-quality and robust audio, so you can get lost in the moment. Boasting a powerful octa-core processor with low power consumption, the Huawei MediaPad T5 lets you run multiple applications without a hitch, while preserving battery life. Expand its memory size using a micro SD card to store up to 256GB of media. Enjoy a smooth and intuitive user experience thanks to Android 8.0, pre-installed on the MediaPad T5. And with Eye-comfort Mode that reduces harmful blue light for healthier viewing, you can also rest assured that you won?t be kept up late at night.